"This year (2006) marks the inaugural year of the American Buffalo Gold Coin Program. The Presidential One Dollar Coin Act of 2005 authorizes the Secretary of the Treasury to strike one ounce, .9999 fine gold bullion coins. These (2006 dated coins) are the first pure gold* coins ever issued by the United States Government." "The American Buffalo Gold Proof Coins are collector versions of the official United States Mint American Buffalo Gold Bullion Coins and are available in limited mintages. The designs are based on the original 1913, Type I Buffalo nickel, as designed by James Earle Fraser. The obverse features a profile representation of a Native American. The reverse features an American Buffalo (also known as a bison). The 2006 American Buffalo Gold Proof One Ounce Coin is packaged in a blue velvet, satin-lined presentation case and accompanied by a custom-designed Certificate of Authenticity signed by the Deputy Director of the United States Mint." These new US Buffalo 1 ounce gold coins weigh exactly 1 troy ounce. "The 2006 American Buffalo Gold Proof One Ounce Coin is packaged in a blue velvet, satin-lined presentation case and accompanied by a custom-designed Certificate of Authenticity signed by the Deputy Director of the United States Mint." Design has a reverse proof type of finish, where the background is mirror like and the image has a cameo frosted look. "American Buffalo Gold Proof One Ounce Single Coin Product Limit: 300,000." 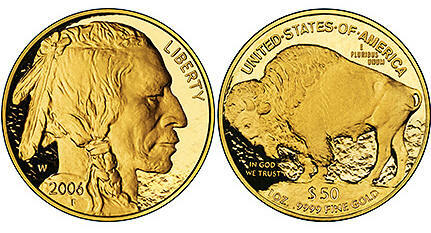 Each Buffalo coin has a $ 50 face value - metal content is 1 ounce of solid 99.99% gold. The U.S. government Mint has announced plans to produce these every year beginning with 2006. * - American Eagle $50 US gold coins contain a full ounce of gold. However, copper is added to the gold to give the coin hardness against wear when circulated. The result is that the American Eagle gold coins weight slightly more than an ounce. in original box with Certificate of Authenticity. Proof Buffalo US gold coins are the first US gold coins to feature a background that has somewhat of a hammered textured appearance. Minted at the US government's West Point Mint and features a "W" mint mark on the front (behind the Indian's head). in original box with Certificate of Authenticity. Minted at the US government's West Point Mint and features a "W" mint mark. Original US government Mint Item # BA8 and minted at the West Point Mint with a "W" mint mark on the obverse. Same design as the 2006 Buffalo-Indian Head gold coin. Original US Mint Item # BA9 with a W mint mark. * - Some information and images are used with permission and may be copyrighted by the United States Mint in 2006. Our webstore shopping cart is a PayPal compatible cart. When you choose "checkout", it should take you to Paypal's secure website to make payment. You can also can send payment directly from Paypal's secure website using our email address of jlynn@aeneas.net by clicking on the Paypal "send money" tab. Your address must be "confirmed" with PayPal for us to accept your PayPal payment. Paypal processes payment to us when you use your Visa or Master Card credit cards, as long as they can confirm that your credit card billing address matches your order shipping address. (Some credit card companies will confirm addresses, others won't.) They may also put a maximum limit on the total amount of payment you can make in a given month. Example, $2,500. All items are guaranteed genuine. Exchanges may be made within 30 days, if there is a problem with the item received. Returns may also be made within 30 days, but are subject to a possible restocking fee equal to any difference in market value of gold (or silver) from the time you ordered. Please note: We sell these coins at prices very close to our cost. Because of this, prices may change without advance notice and are subject to early sell out. Quantities are limited. We attempt to keep prices on this page up-to-date. However, internet server delays and other unexpected issues can impact our ability to do so. In the event that you order something using our shopping cart that we can no longer supply at the listed price, we will notify you promptly. and their certification of authenticity and grade - Click here. Copyright 1999-2005 JLYNN Thank you for visiting us at http://lynncoins.com No inventory is kept on the premises. ( c ) 2 00 5 J L y n n a n d C O . . . . . . . .